PamKittyMorning: One of those days. Yesterday started out pretty great. Up early, full of energy. Weather is perfection, low 80s, nice cool breeze. I went out and ran my errands, went to the grocers, you know that kind of thing. So I came home, got my borders cut for my cherry quilt and then remembered that I had bought a little gift for a friend and I needed to get in the mail. Hmm. Where did I put that? Probably someplace safe, right? Then BAM my whole day turns into one of those days when I begin to TEAR THE PLACE APART looking for it. Of course since lately I'd actually cleaned up a little, I thought it I might have accidentally thrown it away. Then I thought I might have casually tossed it on the cutting table, aka the dining room table, so I went though all the stuff I had laying on that table and believe me that took forever, since I actually put some stuff away in the search. Maybe it was in my little cart, emptied that twice. I was pretty sure that I put it on the counter in my sewing room, so I went though that stuff probably 10 times. Oh wait I might have lobbed it onto my sewing table with other stuff. Went through all the stuff on my table maybe 10 times. Through the recycling that sits at the end of the table because what If I knocked it off. Through the trash in case it was wrapped in mini bubble wrap and I didn't see it inside. Oh maybe it's on the counter, the table, the cart oh wait maybe it's on the sewing table. Finally probably two or more hours go by. NOT EVEN EXAGGERATING. I sat in defeat at my sewing table totally disgusted with myself and my ways. And then I reached behind my sewing machine for about the 100th time and there it was. So then I put the borders on the quilt and called it a day. What's new with you? LOL!! Frustrating...but somehow a bit funny too!! Glad you got the borders on...it is beautiful!! LOL that was fun to read. But I know how frustrating it is! I do that with Xmas gifts that I buy throughout the year. And I made myself crazy trying to locate my Minick & Simpson Chippewa pattern, finally gave up and ordered another copy! Wow, that sounds so familiar! It always amazes me how I can search the same place several times only to find it is there all the time!! How does that happen?? So glad you found it! Your quilt is absolutely adorable by the way!! Sounds completely normal to me. 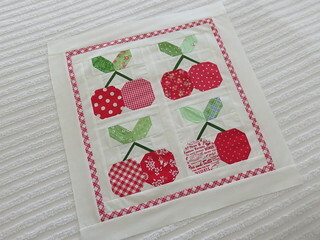 I just need to tell you that the little red and white bias cut check border on your sweet quilt is perfection! Lovenzee it. Glad I'm not the only one with safely stowing something and forgetting where it safely is. Sometimes I get to my sewing room for something and think, "Now what did I come in here to get? Takes a sec sometimes before I say, Oh, yes!" Being nearly 75 is my good excuse. Oh I can sew relate! Finally got better about Christmas stuff and stashed a container in my closet just for them. About 50% make it in there. Never have been able to figure out how things just appear where you have already looked a zillion times. ....it's like where do the socks go? You should write a book. I could totally follow along on your anxiety and search and heart thumping moment (maybe because I've been there too often). I'm just sooo glad you found the little gift! Now I will enjoy a cup of coffee and relax with you after experiencing that awful moment with you :)! Miss Kitty you're making me lol all over the place. I can just imagine you in your search! Everyone sounds like they are in the same place as you, so at least your aren't alone in your trials. I have been a loyal Kitty fan for years. Keep it up, you make my day. I tore up my sewing room looking for a zipper the toher day, then had to clean it up and put everything back. Some days you just have to sit down and give a "heavy sigh".....The mini looks awesome!Hope things are better today! My Wednesday was kind of like that in the morning...luckily it got better as the day went on! I LOVE your mini cherry pie! Such an entertaining read and a sweet mini too. :-) I am lucky if I can remember I made or bought something for someone's birthday! And am forever losing things, mostly in the sewing room or garden. It's good to know I'm in such good company. Ugh! Thankfully, those days are few & far between. . . . glad u found it tho, and xoxoxo your MINI! LOL you are a girl after my own heart! I'm getting caught up on my blog reading and you never fail to disappoint! :O) Love the pictures of your projects and all that you share! Have a great day! totally worth everything! the cherries are just adorable! !